The house was built in 1925 and has about 3,400 square feet. “There’s a lovely backyard with grassy area, trellis, citrus trees, and a detached garage with bonus room.” For more photos and information about the property, check the Sotheby’s Listing. The Paisleys also have a log home in Franklin, Tennessee, which was featured in a 2007 issue of People magazine. They reportedly spend most of their time in Nashville, where Brad recorded his new album Wheelhouse, coming out April 9. Jeremy Renner's Art Deco-Style House in L.A. I love those vintage California 1930’s & 40’s homes! This one looks like it is actually lived-in and its nice to see evidence of children in the house! It’s interesting to observe the contrast between the starkness of their CA home and the warmness of their TN home. I’m sure that the staging for the listing in CA had something to do with that… Both of them are adorable. This home just oozes with vintage charm and character. A beautiful restoration that hasnt been over-done but rather blends the old and new together tastefully. I love that they left the old green tile and knobs in one of the bathrooms. It didnt come across to me as “stark” but rather clean and understated which is nice to see in a celebrity home. More “real” and comfortable than I imagined. Definitely prefer these celebrity homes that look like real people might actually live there. Any ideas why the dining room looks so cramped–is it just a bad shot or is it really just too small? I wondered that, too. It kind of looks like it might have been a sunroom at one time and they converted it into a dining room, but I don’t really know. I love the outside and the inside but not the colors or the decorating, which doesn’t fit the style of the house. Everyone is leaving California to protect their money. Not surprises. Hey, do we know yet where Tori Spelling moved to? Everyone? Really? How will I ever find a rental truck if there are all hightailing out v’ here? The Paisleys probably didn’t live in state more than the required 180 days to owe state taxes. The dining room looks like a converted porch because of the step (not the step down the step itself; it has no presence). The original location was probably where the stove is now and the original kitchen started at the fridge and went back to the eat-in area. And finally $3,000 k seems like allot without an ocean view. Their home is lovely. It feels cozy and lived in. I also ADORE the FOTB house, and it’s interior has aged well. 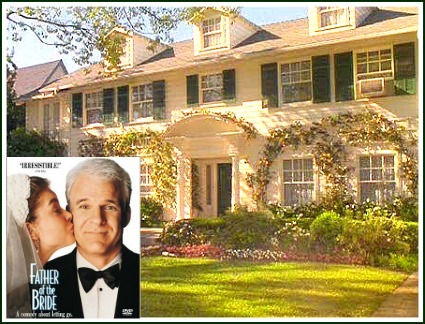 I like how it looks so normal like everyday living and not all ostentatious and the Father of the Bride house is one of my favorites!. Love the outside, the inside not so much. Love the bones of the house, but don’t care for the decorating. I never have been a fan of red and/or yellow, so maybe it’s just me. Except for the kid’s room (why that, I wonder?) it looks pretty empty for staging: note no dishes in the glass cupboard in the kitchen. The house itself is adorable, though. Love those period houses. What a beautiful home. I’m glad they didn’t gut and modernize it. It is absolutely charming. Kimberly Paisley will always be Annie Bank to me too. I also enjoyed her in “According to Jim”. We watched the show “Father of the Bride” right after we got married and said if we ever had a daughter we would name her Annie. 5 years later, we got our little Annie Mae. I like this house. I also was happy to see signs of “real life” in there…especially the kid room and also the kitchen. I looked at the kitchen a couple of times…it’s not celebrity perfect and I think that’s what I like best about it. I think this looks like a very comfy and “lived-in” house. Thanks for the pictures! Julia ~ I think you should do a post about the Duck Dynasty houses. I can’t get past Willie’s house – looks like a French Mansion in the South of France on the outside and looks like a cabin on the inside. Have you seen it? No, I’ve never seen that. I’ll have to check it out–thanks! I love that Brad and Kim’s house is completely simple with a bump of lux…Well done! I’m not cray cray about the colors but I realllly like it. This house is amazing! Love how the beams stand out from under the roof. This really gives it that European touch we all like so much. You have great taste guys. Thank you for sharing all these images. Warm regards, Shelly.